With Christmas coming, there's a few brewers going down the box set route beloved of record labels. Among those to do so is Hawthorn Brewing, who have packaged together their five core beers along with their most recent seasonal: the New World Lager. 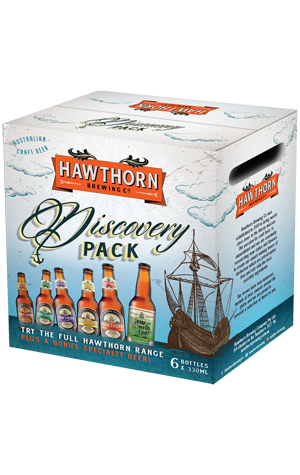 If you're unfamiliar with their range (which presumably means you're the target audience for a pack bearing the name Discovery), those five core beers are the herbaceous, spicy Pilsner, the malt led, English brown-inspired Amber, the soft melon and tangerine aroma'd Golden Ale, the West Coast US style Pale Ale and the tropically aromatic Australian IPA. NB If you're reading this before November 25's Friday newsletter, we're giving a couple away to readers too.